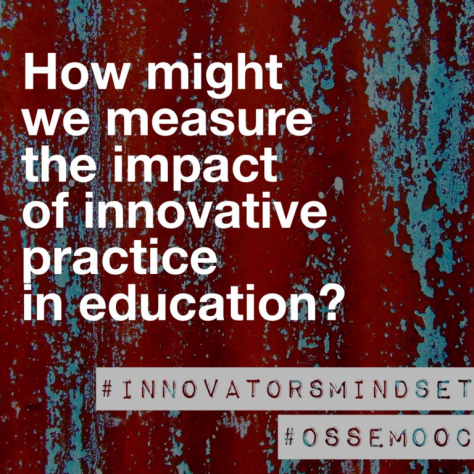 Here’s the 4th question for the #ossemooc #innovatorsmindset bloghop series. Thanks, as ever, to Tina Zita for the amazing visuals. The words that were sticking in my head were: “inchworm, inchworm, measuring the marigolds. Seems to me you’d stop and see how beautiful they are.” But when I went back and listened to the whole thing, I realized that the image of the inchworm, based in his numeric framework, cheerfully reciting his math facts that will probably help him “go far”, was also relevant. We are, in many ways, caught in the inchworm’s dilemma. As we begin to shift our practice, to take on the innovator’s traits, to ask our students to be co-learners with us, to genuinely question the status quo, we are still expected to come up with something quantifiable to show growth. Something that can go into a data portal, something that results in improvement on a standardized test, something that can have a numeric result assigned to it to go on a report card. Like the inchworm, that’s the existing language we have to work with, and, as classroom teachers, that’s the language that students and parents and administrators (and on, up the chain) understand and expect to see. That puts us in a difficult spot, because it’s very difficult to quantify the fact that we’ve begun to look at the marigold’s colour, and where it prefers to grow, and what uses people made of it in the past, and the fact that it’s a native North American plant, and what it might bring to our schoolyard gardens and a whole bunch of other things we’ve found out by letting our students go deep with their learning, and show that learning in myriad different ways. Being able to convey the value of that learning, and the growth involved is going to take a lot of deep conversation and reframing for all of us. It’s not going to be easy, but things that are worth doing rarely are. This March break, I watched my younger son and his friends use a variety of technologies to communicate with each other, problem solve, and plan excursions. This amazing group of 12 year olds troubleshot audio problems in a transcontinental Skype call; used a combination of Google Hangouts and texting to set up a detailed cross-city bus excursion involving multiple departure points and destinations; and worked through the bumps that inevitably come when people are taking public transit from all different points. They laughed a lot, helped each other through their frustration, and found and solved real-world problems. Exactly what we want for our students, and one way that we could measure the impact of innovative practice. Are these the skills we’re helping develop? This entry was posted in Education and tagged #innovatorsmindset, assessment, innovation, ossemooc. Bookmark the permalink.